I like cake. It doesn't matter what flavor—chocolate, vanilla, strawberry, salted caramel—I enjoy them all, but I'm especially fond of lemon pound cake. This is largely due to its simplicity as it's one of those rare cakes that doesn't need to be drowned in frosting to make it delicious. A thick slice coupled with a cup of coffee (or better yet some vanilla bean ice cream) has the power to make even the worst day a little brighter. The trouble is, I don't often find myself with enough time for baking. If you want my advice, if life hands you lemons don't waste them on lemonade, make a pound cake instead. Cake makes everything better. Preheat oven to 350°F. Butter the insides of a loaf pan, line the bottom with parchment paper and set it aside. In a mixing bowl cream together sugar and room temperature butter. Add lemon zest, eggs, buttermilk, and lemon juice then continue to mix until well incorporated. In a separate bowl combine flour, baking powder, and salt. Add the dry mixture to the wet ingredients and mix until smooth. Transfer the batter to the greased loaf pan and bake for 65 - 75 minutes, or until a toothpick inserted into the center of the cake comes away clean. Allow the cake to cool in the pan for at least 10 minutes before removing to a cooling rack. Cool in the pan for 10 minutes before removing to a cake platter or plate. Loaf pans come in several different sizes, for this recipe you'll need a 1.5lb loaf pan like this one from Nordic Ware. This cake is tasty when paired with ice cream (I'm partial to lemon and lavender or vanilla bean) but it's also quite good eaten on its own or topped with sliced strawberries and fresh whipped cream. There are very few things my little man loves more than his mother (or that's what I tell myself anyway) but if I'm being truly honest I rank right up there with his favorite stuffed animals, hot wheels cars, and super heroes. It's funny how the mind of an almost five-year old works, but I count myself as fortunate to be considered at the top of his list of favorite things. I know as he gets older that won't always be the case, so I'm enjoying every last second of it while it lasts. This year as we sat down to talk about birthday cakes my little guy surprised me. I had assumed we'd be doing a Batman or Angry Birds theme, but instead he wanted to see Hulk, smash—right out of his cake. I kept with the trend of using his birthday gift as a cake topper (which is seriously the easiest way to decorate a cake) and rushed right out to buy a pair of oversized Hulk fists. Three stores later I somehow managed to turn up completely empty, it seems giant Hulk hands were not the "in" toy this year. Of course I didn't let this stop me, I hopped on Amazon and 2 days later they showed up on my front porch, just in time to go on top of the cake. If you're looking for an easy DIY cake for your superhero fan, this one couldn't be easier and as an added bonus it's covered in Oreos—because seriously, who doesn't love Oreo cookies? Before beginning make sure to allow your cake layers to cool completely, otherwise your buttercream will melt. Place the bottom cake layer on a plate or cake stand, cover the top with a good-sized portion of buttercream, then place the second layer on top. Wrap one of the Hulk hands in plastic wrap any place it will come in to contact with the frosting (this makes cleanup a lot easier when you’re done.) Cut away part of the top cake layer, exactly the same size as the bottom of your Hulk hand and place the hand firmly into the layer of buttercream to help keep it stable. Use the remaining buttercream to ice the top and sides of the cake. Remove the cream center from your Oreos, crumble the cookies, and place them around the Hulk hand. Add your number candle, making sure to keep it far enough from your Hulk hand that you won’t accidentally melt it when you light the candle. Serve the cake immediately, preferably with a side of mint chocolate chip ice cream. If you're having trouble finding hulk hands locally they're fairly easy to come by online. I used a set of Hulk Gamma Grip Fists that I found on Amazon. I'm convinced that there isn't enough cake in my life. In any given year I get to make two cakes, one for my husband in July and one for my son in September. My husband generally requests German chocolate cake which is pretty straight forward for me at this point; I've been baking him the same cake for over 10 years now. If I try to change things up on him he tells me to stop messing with perfection. These days I tend to listen. My son's cake on the other hand is one I look forward to ever year. It's so much fun sitting down and sketching out ideas or browsing pinterest for inspiration. I love to see his eyes light up when he first sees his cake, although this year it wasn't a complete surprise because he came in the kitchen to "help" me make it. What he really wanted to do is steal as of the chocolate rocks and chocolate covered almonds as he could get his hands on. Being a good mom I bought an extra half pound so he could happily munch away and I could get the icing and decorations on the cake. This is the first year I've had the cake ready before 9pm, which means my time management skills must be improving. We decided to have cake before dinner and once we were done there was hardly enough left for the next day. Overall, I'd say the cake was a huge hit, now I just need to come up with an idea for next year. Preheat oven to 350°F. Butter both 9 inch cake pans and place a parchment round in the bottom to prevent the cake from sticking. Separate the yolk and whites from two of the eggs and set aside. In a bowl combine flour, baking powder, baking soda, and salt then whisk ingredients until combined. Using a stand mixer set on medium, add butter and beat with the paddle attachment until soft and creamy. Add sugar and beat for an additional two minutes. Add eggs one at a time, then egg yolks making sure to beat the mixture for 1 minute each time you add an egg. Periodically stop and scrape the sides and bottom of the bowl. Open vanilla bean pod with a knife and scrape the insides into the batter. Add almond extract and optional yellow food coloring. Reduce the speed of the mixer to low and alternately add buttermilk and dry ingredients. Scrape down the bowl, then transfer batter to the greased cake pans ensuring the batter is evenly distributed. Bake for 26 - 30 minutes or until the cakes are done in the center and start to pull away from the sides of the pan. You can check if the cakes are done by inserting a toothpick into the center, if it comes out clean you're cakes are ready to be removed from the oven. Allow cakes to cool for 5 minutes on the stove before running a butter knife around the edges. Invert over a cooling rack and peel off the parchment paper. Once the layers have cooled they can be wrapped in plastic wrap and stored overnight at room temperature or placed in the freezer for up to 2 months. In a double boiler add chocolate chips, cocoa powder, and half of the brown sugar. Stir occasionally until all of the chocolate is melted and the sugar is evenly distributed. Remove from the heat, but do not allow to cool completely. Using a stand mixer with the paddle attachment add unsalted butter and beat on medium for 2 minutes or until the butter is soft and fluffy. Add remaining brown sugar and continue to beat for an additional 2 - 3 minutes. Add salt and vanilla extract, then reduce the speed of the mixer to low. Slowly add the chocolate from the double-boiler, then the confectioners' sugar. Once both ingredients have been added set the mixer speed to medium and continue to beat for several minutes. The icing should be light and fluffy and ready to use immediately. Once the cake layers have cooled you can begin assembling the cake. I suggest making the cake layers a day in advance to allow ample time for cooling. If necessary, trim the cake tops so they are level. Place 1 layer on your serving plate or stand, add a good sized amount of icing to the top and spread it out evenly. Spread icing on the top and sides of the cake. You can use an icing knife to make this step easier, but don't feel like you need to make the icing completely smooth. 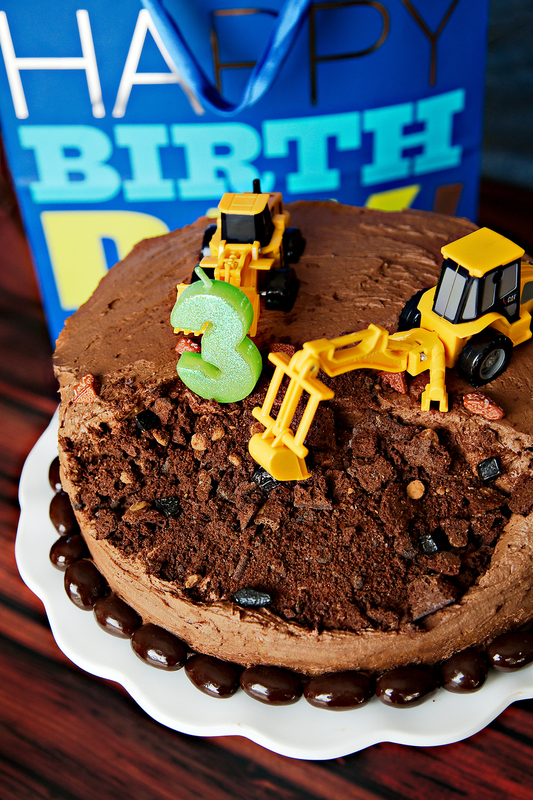 Make sure there is ample icing in the pit so the "dirt" doesn't slide when you move the cake. Crumble the brownie brittle or Oreo cookies, add it to the pit, and top with a few chocolate rocks. Wipe away any excess icing on your serving platter. Place your construction vehicles and candle, then add dark chocolate almonds around the base of the cake for a more finished look. You may be able to find the dark chocolate covered almonds and chocolate rocks in the bulk bins at your local grocery store. Otherwise they can be ordered from Amazon using the links above.